6. 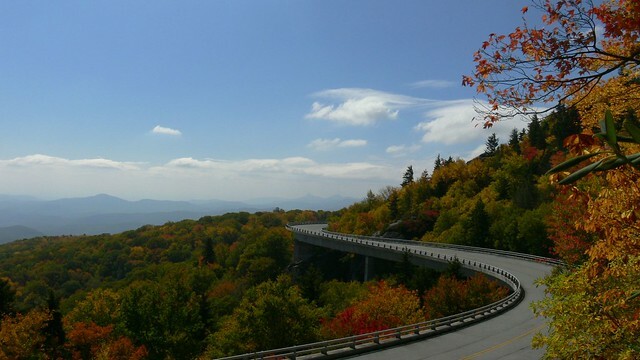 Blue Ridge Parkway This 469 mile long scenic drive starts in Virginia, meanders through North Carolina and ends in Tennessee. It is an extremely popular destination among those who covet the myriad of colors our region is famous for producing. Seeing your favorite vistas and hikes cloaked in the most vibrant fall colors is an added bonus, however, the congestion the parkway experiences is almost enough to make you steer clear. The BRP is also celebrating their 75th anniversary this year and has events scheduled throughout the season for everyone to enjoy. 7. Linville Falls Located at milepost 316.5 this highlight is a stop off along the Blue Ridge Parkway that attracts a high volume of visitors during any season. The 90 foot powerful plunge can be seen from many different angles and can be reached through a variety of hikes that range from easy to difficult. It's one of my favorite waterfalls, especially in Fall. 8. Wiseman's View Just a short distance from Linville Falls this overlook offers an equally impressive display (sans waterfall) of the Linville Gorge. The trail to the rock outcropping requires nothing more than an easy stroll, and the concrete path makes it handicap accessible. 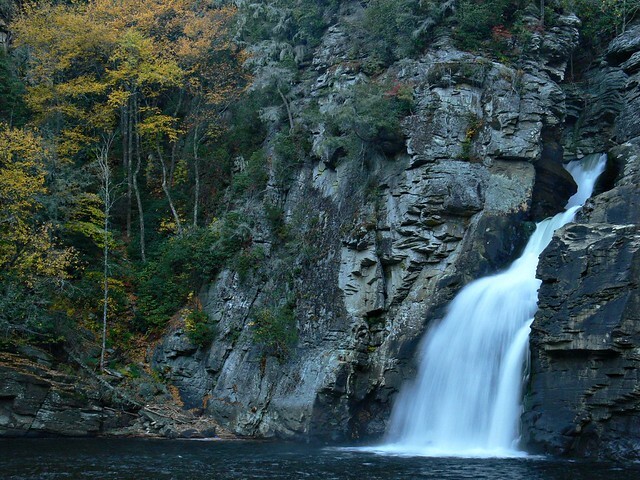 This detour won't take much time, which makes it a great quickstop before or after seeing Linville Falls. 9. Grandfather Mountain At an elevation of 5,946 ft above sea level, the views from this biosphere are incredible, especially from the top where the Mile High Swinging Bridge resides. Wildlife habitats and hiking trails will also keep you busy during your visit to GM to get your monies worth. Not too long ago, the state of North Carolina purchased GM's backcountry for a state park; before this took place an overnight hiker had to purchase a permit to camp, however, now the permits are free. 10. Hiking @ Cone Manor From this central location off the Blue Ridge Parkway you can access an array of trails. Shuffle through "The Maze" down at Bass Lake or hustle your way up the Flat Top Trail to the firetower where your efforts are rewarded with spectacular 360 degree views. We start a lot of our hikes from this point because it's conveniently located near Boone and we have options to choose from depending on how hard we're willing to work. 11. 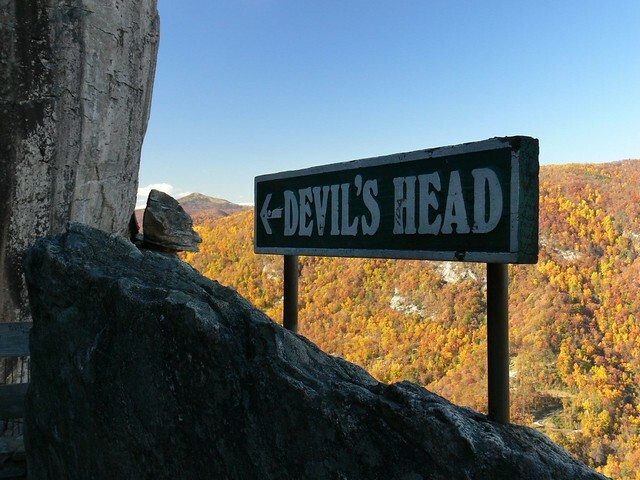 Chimney Rock State Park in NC A perfect place to find fall and reconnect with nature is at Chimney Rock. With nature trails, a waterfall and fresh mountain air this place seriously can't be beat. It is definitely not a secret, so don't expect to have the place to yourself, though. These posts are keeping me motivated about Fall, because right now it seems as though we skipped this season altogether and winter has begun to set in. Or at least it has for the past two days. We've already had our heater on and I've broken out the sweaters! I hope this cold snap subsides soon, because I really want to experience some FALL. This is a continuation of a series about "Fun Things to do in Fall". In part 1 (link below), I shared a list of festivals and fairs happening across North Carolina, and even one in Georgia, while this portion of the list is focused more on state parks around Western North Carolina. With this list you will find links to archived posts or to other websites where you can gather more information. i've always wanted to drive the parkway but never have done it. the shots are spectacular! Beautiful photos of beautiful places. The first time I was in Boone NC, we arrived on a moonless night, and the fog was so thick we had to open the car door and drive very slowly beside the center line. It was both scary and exciting! heading out for a fall drive right now, in ontario. nature is ablaze with colour. 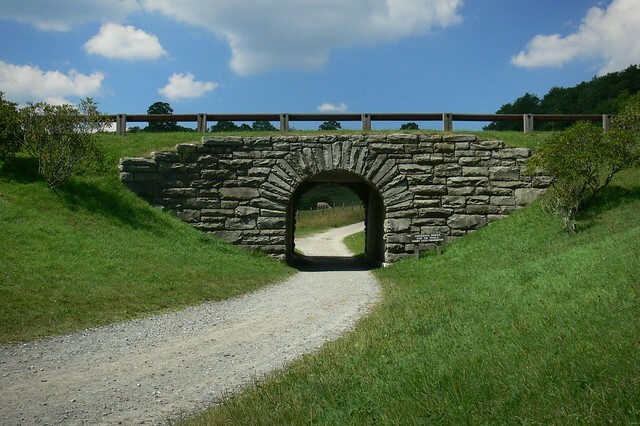 I love the stonework of the parkway. The North Carolina Mountains are a blessing to our world.